Nigeria is catching and intends to add substantial momentum to the growing off-grid, mobile pay-go solar energy wave sweeping across Sub-Saharan Africa and other parts of the world. Favorable renewable energy economics led Vice-President Yemi Asinbajo to announce the launch of a national Solar Home Systems (SHS) program on the outskirts of Abuja, the capital city, this week. The SHS initiative, Asinbajo said as Acting President, will enable Nigerians to close the wide gap in energy access and provide citizens with safe, reliable, affordable and environmentally friendly electricity, according to a news report. Nigeria’s national solar homes initiative is being led by Niger Delta Power Holdings Plc in partnership with U.K.-based off-grid, mobile pay-go systems specialist Azuri Technologies. “The grid is just one transmission centre, if you like, but we cannot take all our power from the grid. And so, in the next few years, it will not be absolutely important for you to be connected to the grid because we will be deploying every type of off-grid solutions that we can deploy and we want to do that in the industrial areas,” Asinbajo was quoted as saying. Apparently, Asinbajo and the Nigerian government view SHS as the launch pad for providing sustainable energy access across the entire country. The government and Nigeria’s national SHS program partners aim to provide 20,000 homes with off-grid solar power systems over the next 12 months in the program’s initial phase. NDPHC managing director Chiedu Ugbo noted that the SHS initiative was right in line with the company’s mandate to close the nation’s electricity access gap. “There are many Nigerians (an estimated 70 million) without any connection to the grid who still rely on rudimentary lighting systems characterized mainly by use of kerosene lamps, candles and petrol generators with attendant health and safety risks and indeed financial challenges,” he was quoted. Installing small off-grid solar PV-battery storage systems and pico-solar DC household products – chargers, LED lighting, radios and others – in Sub-Saharan Africa. 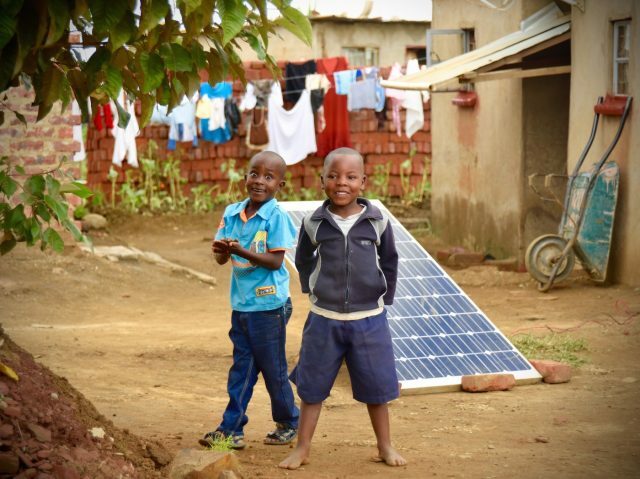 Cambridge, U.K.-based Azuri Technologies is one of a growing roster of innovative mobile pay-go solar energy startups writing a new book on energy resource and socioeconomic development in Africa. Launched in Nairobi in 2011, tens of thousands of Azuri’s PayGo Energy systems and counting have been installed in 11 Sub-Saharan countries. Customers pay a small one-time installation fee, then purchase scratch cards or use an integrated mobile money service to top-up their home solar energy units. Azuri has found that the system cuts customers weekly energy spending by as much as 50 percent. Significantly, they start saving money, improve home safety and start reducing greenhouse gas (GHG) emissions and environmental degradation immediately. “Whereas residents typically spend $2 per week on kerosene, they might pay $1 per week for the basic PayGo system. So for half the cost they get proper, clean lighting and the ability to charge mobile phones when they want right at home,” CEO and co-founder Simon Bransfield-Garth said in an interview. In Nigeria, NDPHC has already installed 200 off-grid, mobile pay-go home solar energy units in Wuna as part of an SHS pilot program. Moving forward, communities in 19 northern Nigerian states are being targeted as SHS program partners work to achieve the SHS goal of installing 20,0000 off-grid home solar energy systems across the country in 12 months. In a recent, related development, Nigeria’s Bank of Industry (BoI) launched a 1 billion nara (US$3.1 million) off-grid, pay-go solar energy fund as part of its Green Energy Project with the UN Development Program (UNDP). The bank will lend and/or invest the fund’s capital on favorable, concessionary terms to qualified businesses installing mobile pay-go and other forms of off-grid solar energy systems and services across the country, according to a news report.